Baccano! And Non-Chronological Storytelling « Geekorner-Geekulture. I’ve seen someone make the recommendation that newcomers to the show should watch the original broadcast order. Their reason? The first arc is by far the most interesting one, and the show sort of flounders and meanders around with lack of much interest and tension after it ends. He’s right. Splitting the first half means you get to enjoy the best arc for longer, and it introduces mystery, because the first arc actually sets up the situation. 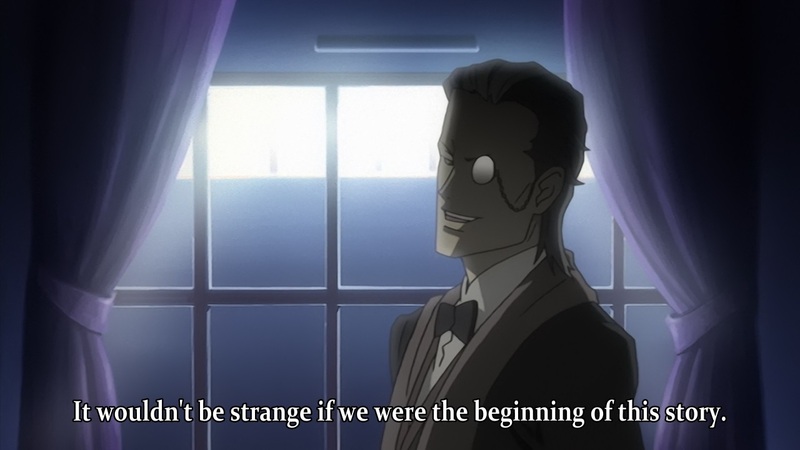 He’s right, but that logic could be applied to any story where the first arc is the strongest, and even increases if it contains a mystery, where the show moves to a “stable situation” afterwards, but in that case, why indeed should I care about Baccano!’s non-chronological storytelling, especially considering the original novels by Narita Ryogo do not contain chronological leaps within each novel (as far as I’m aware)? How is the time-skip truly integral to the show’s storytelling and mood? It’d help, of course, to try and figure out whose story it is, and what it is about, if we are to try and decipher if the storytelling is integral to the telling of the story. And as with all stories, it’d help if we start at the beginning. Ah, but where is the beginning? In a non-chronological or reverse-chronological story (such as Christopher Nolan’s Memento), where does one start? Where you start has implications on the story, and also who you choose as its focus. And the story does indeed begin with the above two remarks. We may not know where the inner-story begins, but a story is as much the manner in which it is told, and the story that is the series Baccano! begins with said exchange. And what this story-telling is doing is claiming that the order of the story, and who we choose to put at its center will change how we perceive it. This is a claim that goes alongside the feeling with which I opened this piece, that it matters. Saying it is so is not yet enough to make it so, however. I for one do not think that the main theme of the show is to explore this aspect on the structure of narratives, and while the show might have it as its theme, I feel it is even less likely of the source material. To end this digression, I will point out that Durarara! 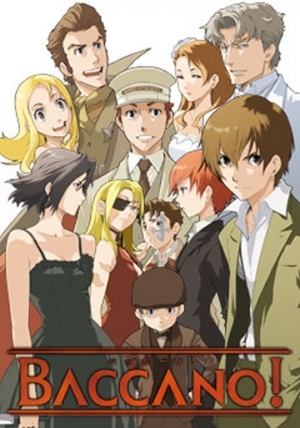 !, written by the same author as Baccano!, and its anime adaptation, directed by the same director, is a show that for its first half of the first season, at the very least, is very much about making the intersection of multiple characters and story-paths into a single tapestry, and is a much stronger proof of concept of this theme. You can read my post on Durarara! !, which indirectly makes this point. After taking a look at where the story started and not being all that much wiser, except to know that the storyteller cares about his story’s structure, let’s look at the other point raised, of which character is placed at the center, and perhaps that will help clarify matters more. Having watched Baccano! though, the thing that stands out the most is how there are numerous characters that could serve as “main characters”, those who change, or exemplify a theme, who move the world, as opposed to supporting characters whose role is to help illuminate and move the main characters. With so many characters, and with the manner in which the story is told, it’s easy to argue that each so-called “main character” is but a supporting character in someone else’s story, and that while the characters are larger than life, and character growth is not strictly mandatory, most of them do not actually undergo “change”, at least not within the story, with us skipping from the “before” stage to the “after”, where the characters are larger than life. Ladd Russo, the tale of his killing escapades and his love for Lua, and the arc of his sacrifice for her whom he promised to kill. Jacuzzi Splot, his gang, and his relationship with Nice Holystone. Ladd’s “younger brother”, the mechanic. Chane Laforet’s tale of growing up and her sacrifices to win back her father. Szilard’s centuries of trying to perfect the immortality serum. Claire Stanfield and all he has done in his career as the infamous Rail Tracer, and Ennis’s attainment of “normal life”. All these stories could be their own stand-alone shows, and the same could be said of almost every principal in the show, aside from Isaac and Maria, as these titanic personalities keep clashing with one another. Said clash is certainly a spectacle, but who’s the main character, and what do we learn from it? It’d certainly be easy to give up on this as well, but then where would I be left, trying to piece together the reason and rhyme of the series? So if the point where it “started” doesn’t tell us much, then how about the spot where it ended? Whose story reached its emotional arc’s conclusion there? And “there” is important, because Jacuzzi Splot and Lad Russo also had such moments of growth, in the “history” of the show (which feels weird to write, as the show keeps skipping about), but there were two characters whose arc came to conclusion in the “now” of the show, and just as it ended, and through them we might learn more of the show: Czesław “Czes” Meyer and Maiza Avaro. So, what was the emotional conclusion to this story, what did it stand for thematically? Forgiveness, and finding a home, founding a home, and creating a family. And when you look back on the show, it is all about the relationships people choose for themselves, from the family Jacuzzi creates around him, to Claire who decides to join the Laforet family. Firo and the Gandors who become one family, Ladd and his followers. Even Eve Genoard, “But he’s her blood brother, where’s the choice there?” you might ask, but as we can see from how she’s contrasted with her brother, Dallas, it’s very much her decision to keep sticking for her brother, to try and make the family of her dreams. Now we have a theme, and we have two characters whose story begins from the very start of the in-world narration and continues until its end, whose story is also the capstone to the narrative‘s narration. Now we’re back to the same question with which we began: For what purpose did we have the non-chronological order for? You could say it’s to keep the “mystery” going on longer, but just like in Haruhi Suzumiya’s case, the mystery is only there to set up the situation that follows. Knowing the answer to “the mystery” doesn’t really affect the core focus of the show – the hijinks with Haruhi (where the setup only answers the question “Why bother?”), and the action with Baccano! – would the show be all that much different if we didn’t know what historical events motivated the characters, while we can still focus on the action? No, I don’t think so. 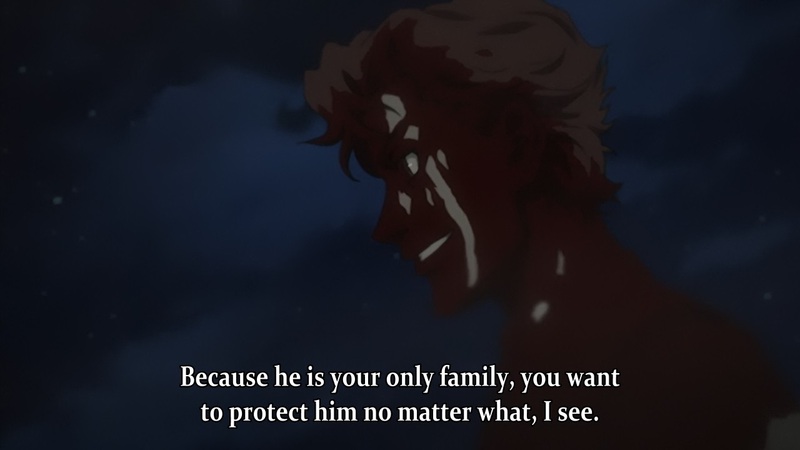 But there are still two reasons why the non-chronological order of Baccano! feels meaningful to me. The first is the non-thematic, but revolves around the experience of watching the show. The “mystery” in Baccano! serves to set up disorder and chaos, of numerous events that whirl around one another. The mystery is there to fuel viewer engagement, and so is the order. Yes, the viewing disorder is always there to fuel viewer engagement, but too often, the rest of the narrative isn’t about disorder, as this one is. All about families. And blood. This part of the answer also has a more prosaic part to it, as can be seen in Cloud Atlas’s narrative – when you have multiple locales or time-periods in which the narratives take place, and they each reach a crescendo at regular intervals, the story as a whole ends up feeling as several stories stitched together. But when all of the storylines reach crescendo at the same time, the effect of the entire show reaching its peak can be achieved. Likewise, when you wish to make a thematic point, it helps if all the storylines make it there together, to heighten the effect, which brings us to the second point. The other reason is meta-analytic. I actually had a hard time figuring out who the main characters in this show are, and until I alighted on Maiza and Czes’s story as “the main one”, I couldn’t identify the show’s theme either. The order of the show helped the theme, by introducing the conclusion to each story not too long after its introduction, or keeping the previous narrative fresh in our memory. Otherwise, too much time might have passed, and we’d have seen, for instance, Jacuzzi’s relationship with his friends and how it turns out much later than the part where the relationship was founded, or the cause to it, and we might not have alighted on the thematic significance, and the emotional significance might’ve been hit as well. In the end, I don’t have any grand reason for why Baccano! feels as if its order is so integral to its identity. I’ve tried to explain it, and I feel the best explanation is that looking back on it, it feels as if the show’s narrative structure, its high points, just would’ve fallen apart had they not been stitched together the way they’ve been. Nor would the thematic heart and the characters around which all end up revolving been identifiable had the story been stitched differently. Is it conclusive? Perhaps not, but it was a fun ride, and I can’t imagine it any other way. Well, I can, but it’s a much more haphazard experience, for all of its greater “order”. Question of the post: What theme would you pick to be Baccano!’s theme, as a whole? This entry was posted in anime, Things I Like and tagged Baccano!, Series Composition, The Melancholy of Haruhi Suzumiya. Firo and Ennis’ little love affair was my favorite bit of the whole show and I think it ties in nicely with your idea of family, although perhaps not as tightly as some of the other examples you mention. It also comes towards the end, right, and is one of the more recognizable expressions of the theme (a non-traditional traditional love story)—and it makes sense, I think, to tie your theme together with something familiar to the audience after all the disorientation in the prior episodes. [I]t makes sense, I think, to tie your theme together with something familiar to the audience after all the disorientation in the prior episodes. Just to clarify, I think you mean for the show to do so, not for me? Yes, Ennis is actually one of the main examples of said theme, not as much Firo (at least not in that segment, as his “chosen family” is still going to be the Gandors, and much earlier in the episode), as Enis, who is choosing her family, the place where she belongs while also casting aside her old one. 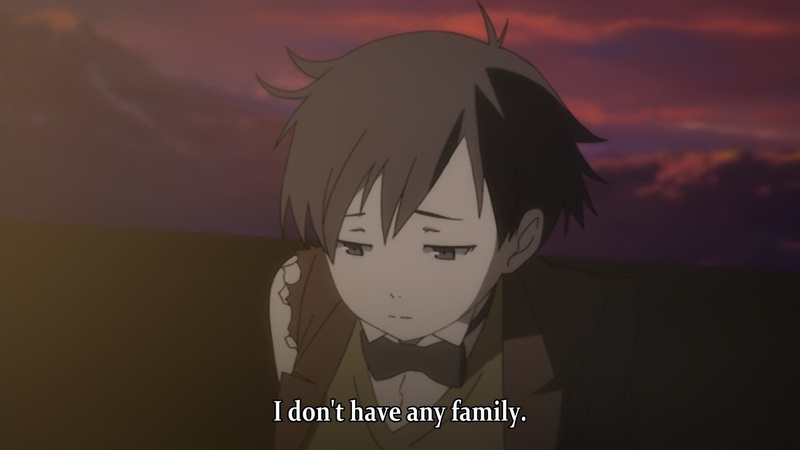 Claire and Chaine is the other part, where you could even say there’s a small discussion on “chosen families”, that comes right at the end that supports the theme. Ladd happens a bit earlier, but it’s a bit harder to think of it in that manner.